How could the US midterm elections impact the FX market? The US midterm election results will be announced on 6th November and, while historically not a big mover in the FX markets, the outcome could take on considerably more significance on this occasion. he US Dollar has been driven as much by politics as Federal Reserve monetary policy ever since Donald Trump was sworn in as President in January 2017. His plans to introduce wide ranging tax cuts, which subsequently led to the eventual implementation of said fiscal policy changes in December 2017, caused a sharp rally in the greenback in the immediate aftermath of his election victory. The currency rallied to a fourteen year high in trade-weighted terms at the beginning of last year, with Trump’s fiscal stimulus measures expected at the time to filter its way through to higher US growth and a faster pace of interest rate hikes. Both have proved to be the case so far this year. Following the introduction of Trump’s tax cuts at the end of last year, the US economy grew at its fastest pace in four years in Q2 (Figure 1). Growth also surprised to the upside in the third quarter of 2018, with the back-to-back growth numbers the largest two period rate of expansion since 2014. A robust growth outlook and tightening jobs markets also means that the Federal Reserve now looks firmly on course to raise interest rates again in December. This would mark its fourth rate hike in 2018, the most in a calendar year since 2006. President Trump’s promise of a fresh round of tax cuts following the November midterms, set to include a 10% reduction to middle-class income tax, means that the outcome of the elections therefore takes on added importance as far as the FX market is concerned. All 435 seats in the US House of Representatives and 35 of the 100 seats in the US Senate will be contested. The Republicans currently have control of both the House and the Senate, the two legislative chambers that make up Congress. While they are expected to retain control of the Senate, it is now looking increasingly likely that they will lose their grip on the House of Representatives. 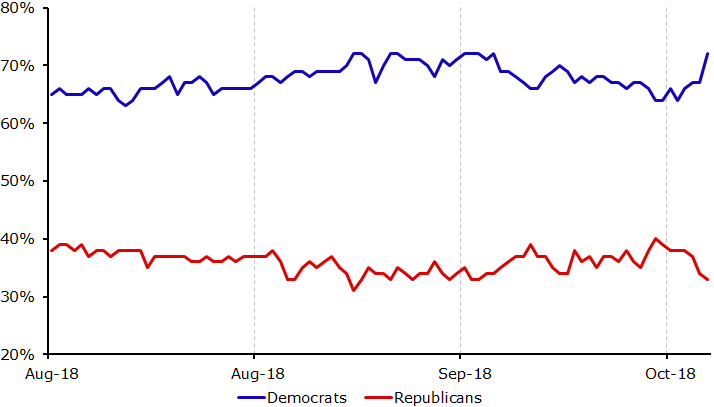 The polls leading up to the elections have been relatively close, with the latest opinion survey from YouGov giving Trump’s Republicans a 43% share of the vote compared to the Democrats 47%. 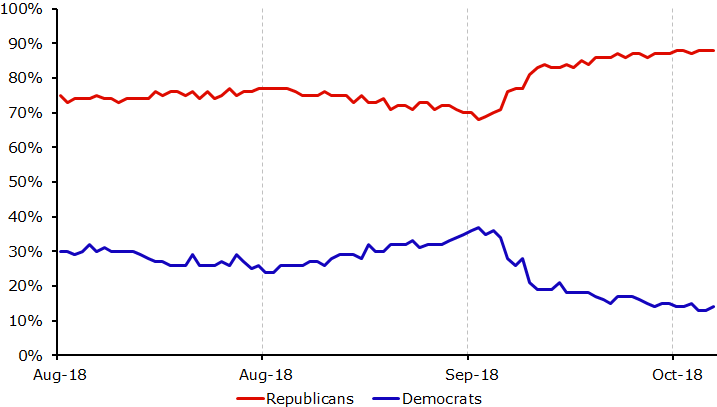 Political prediction website PredictIt are, however, currently placing around a 70% chance that the Democrats triumph in the House vote (Figure 2) and as high as a 90% chance that the Republicans retain control of the Senate (Figure 3). But what kind of an impact could the results have on the currency markets? We have outlined the three possible outcomes, the probabilities we assign to each and their potential impact on the US Dollar. How could the elections impact the US Dollar? This is the most likely of the three outcomes. A divided Congress, in which the Democrats seize control of the US House of Representatives and the Republicans keep the Senate, is largely priced in and would therefore likely be a relatively neutral result for the US Dollar. 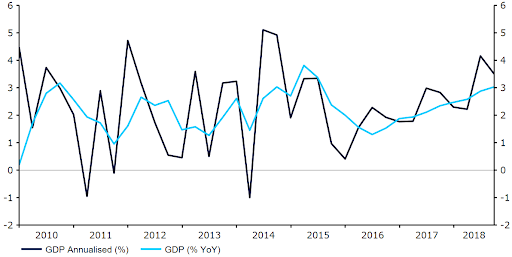 Trump would have great difficulty in forcing through additional fiscal stimulus measures and infrastructure spending that may have otherwise provided an additional boost to US economic activity. With only 35 Senate seats up for grabs, this outcome looks pretty unlikely and would require a systemic polling error according to FiveThirtyEight. We would expect such a result to trigger a renewed bout of US Dollar selling. Not only would a Democrat clean sweep derail Trump’s plans for future tax stimulus, but legislative action would probably come to a halt in the US. This outcome would be a positive for the US Dollar, in our view. Trump’s chances of introducing additional tax reforms and deregulation would increase. As has been the case in the past year, this additional stimulus could help lift US economic activity, push inflation higher and potentially lead to a slightly more aggressive pace of interest rate hikes from the Federal Reserve in 2019. Emerging markets would likely suffer as investors eye the continuation of recent international trade disputes and tariff implementations.